And on Sunday just gone, it certainly felt like it. I could feel the sun warming my skin to a point where it could start to tan. It didn’t last!!! Even though the weather forecasters predicted it to do so... 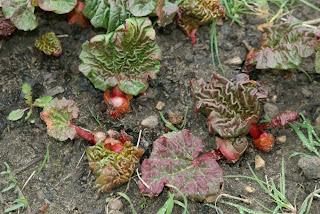 The last 48 hours have been damp, cold, and grey here is Lincolnshire. 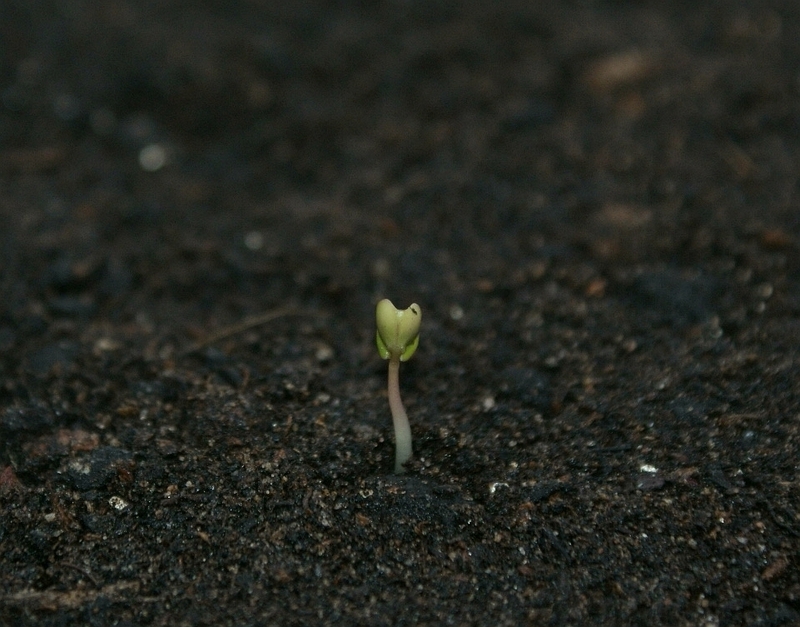 That of course means growth isn’t speeding out of control and so my relaxed demeanour continues. 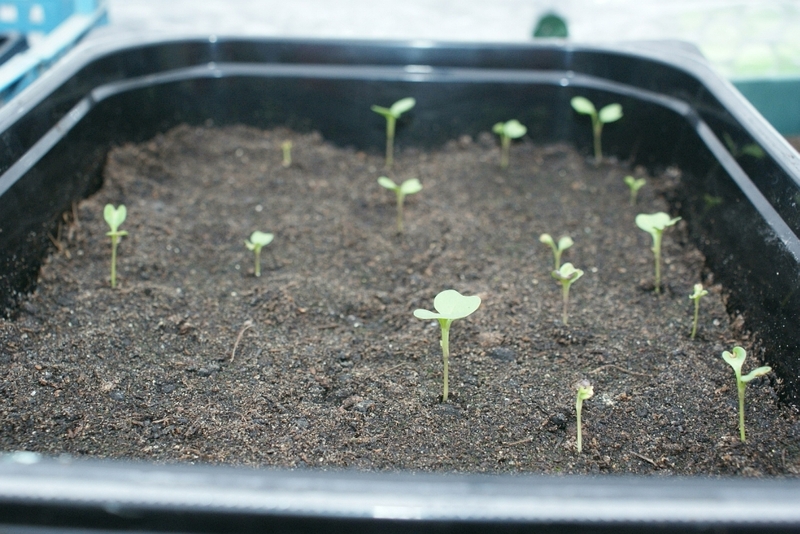 Don’t get me wrong, I keep checking everything daily, rotating seedlings 180° so to keep them growing up straight but because we’re not having that two weeks of early summer like we did this time last year, I’m not frantically repotting on all my seedlings. It’s been lovely... Today was also Garden ReLeaf day and by all accounts, it has gone well considering it was their inaugural event. Hopefully next year’s will get even more press coverage and it can blossom in to a great showpiece within the gardening community. so then here’s a roundup of how some are progressing. The toms and chilli’s indoors are the same as in the last update so I have not included them this time round. Comic Relief, Sport Relief, and now Garden Re-Leaf :) Short update to inform you all of this great new fundraising event. Not long to go now before the first ever Garden Re-Leaf Day! MORE updates from across the regions added WEDNESDAY 7TH March 2012 and more being added all the time! The events list is growing, keep coming back to the site to see what's happening around the country. 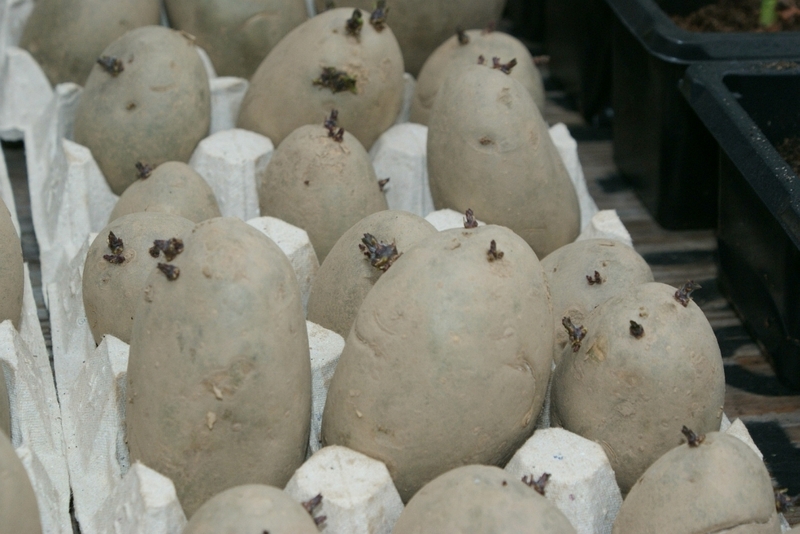 Massive Potato Planting - Over 400,000 primary schoolchildren from over 16,000 schools will be marking Garden Re-Leaf day and the start of the gardening year by planting chitted potato tubers. The children will be harvest their crops in mid-June and could win prizes for their school. Just when you think it’s safe….. It starts to snow!!! Got to love our weather huh. Thankfully that was yesterday and so I managed to get all of my jobs done before hand. 3 days prior to the snow I spent the whole day in the garden and even my wife and kids ate lunch outside it was that pleasant. I uncovered the weed suppressant so to extend the potato bed and surprisingly little weeds remained. This might sound silly, that I expected to find weeds in soil that had been covered up for 18 months but I have a really bad case of bindweed and remember last year seeing it poke through the gaps of the suppressant as it stretched out towards some light. I guess the ends I saw were of some rouge weed rather than an epidemic. 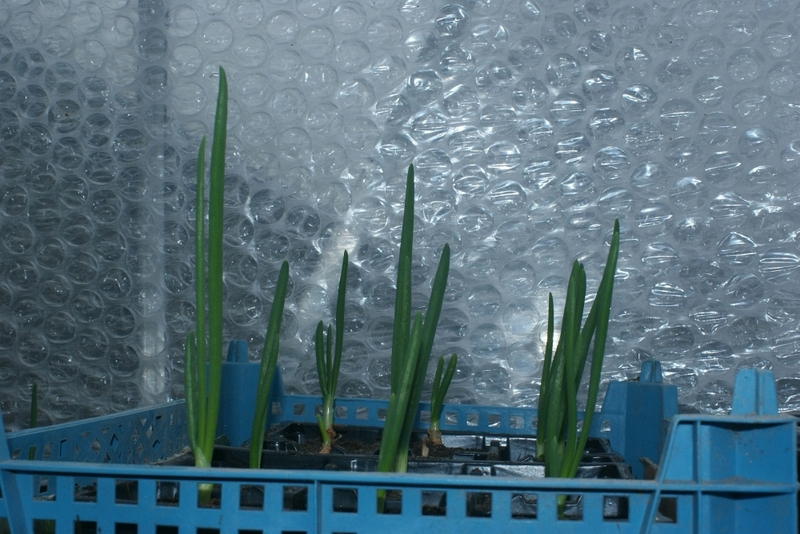 That then was a great start to my days off and so it continued as I gutted out the greenhouse to reorganise it again. I have now freed up both sides of the greenhouse which means I can now grow on both. The bench for seedlings that was down one side managed to fit it sideways right up against the back with only 2cm to spare (and in fact touches the aluminium frame where the two meet) so that was another victory. 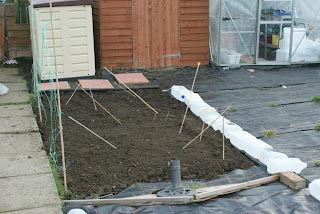 I then had my anti butterfly netting delivered which meant my Brassica cage could be constructed. 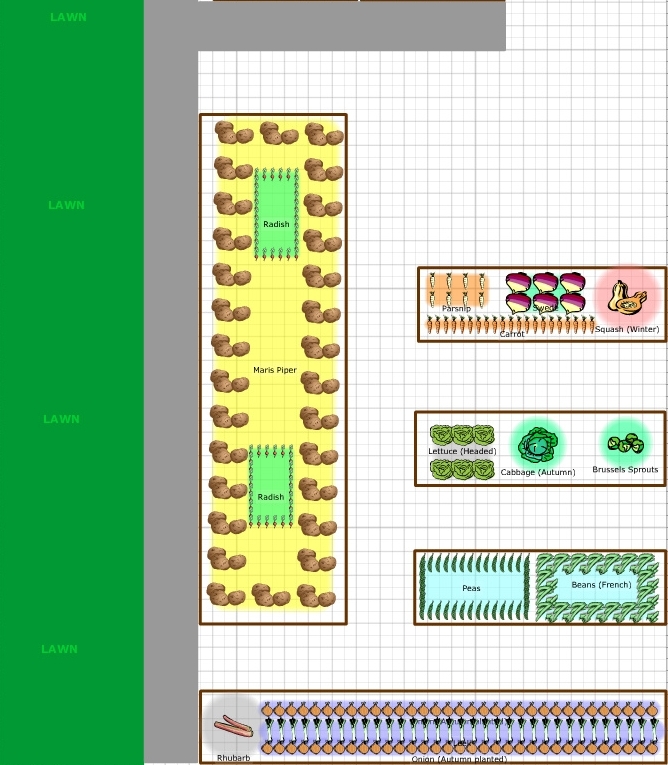 Its dimensions are 2.4m X 1m X 1.4m which will house my Brussels Sprouts this year in an attempt to ward off the hungry caterpillars. 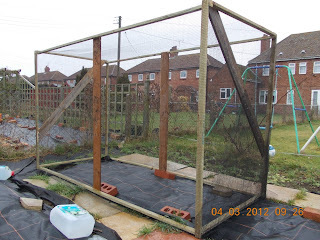 I still have 4m X 4m of netting left so shall construct a smaller cage in height but longer and this will house the cabbages and any other Brassicas I can fit in. Please don’t give me all the credit though as it was a 2 man job thanks to Vince. 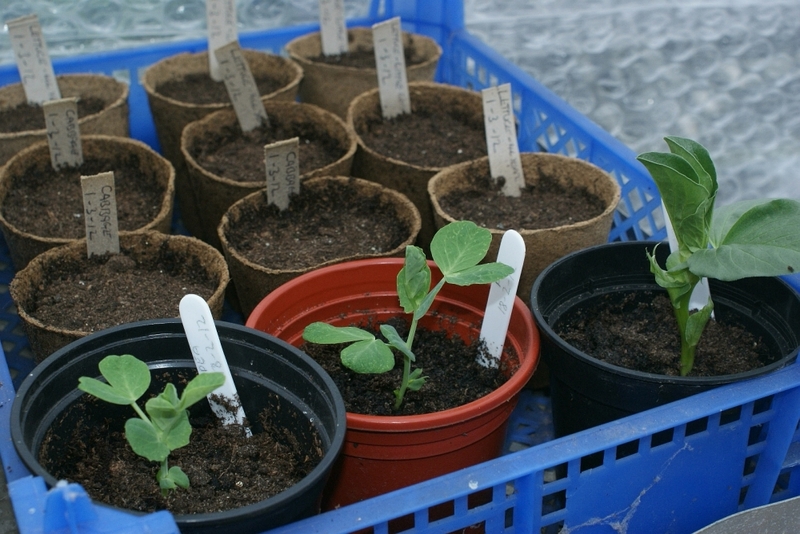 On the seedling front, my first batch are growing on nicely and looking good. 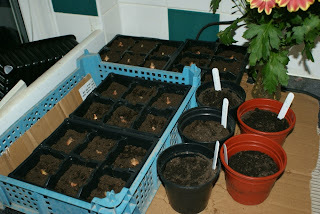 They took really well to being potted on and should now start to push on. 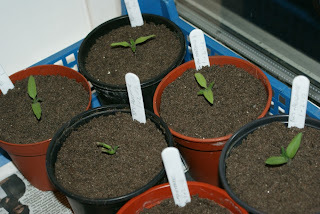 Also my second batch of Tomato seed were sown and have now come through along with a couple of other Chilli seeds that I brought from Wilkinsons (I know, I can’t help myself). I then decided I would start a herb garden in the kitchen and went out to buy some Balcony flower boxes that will fit between our window and worktop. 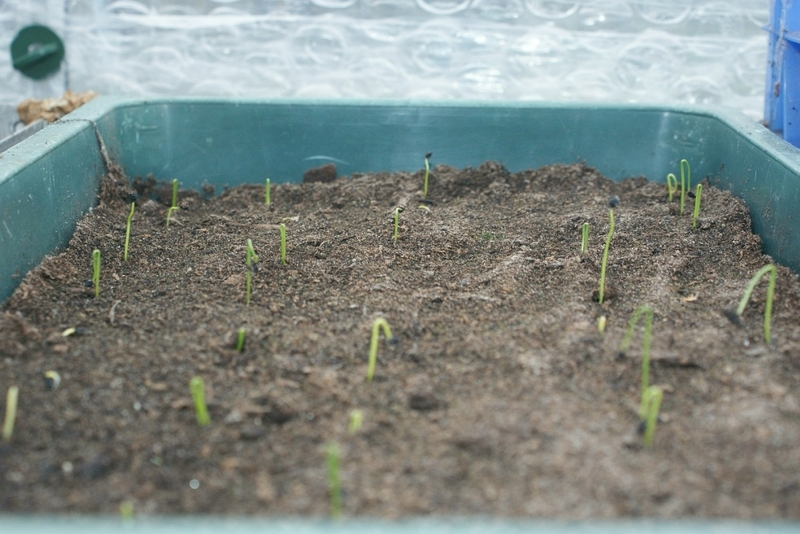 I’ve started off Thyme, Coriander, Parsley, Oregano, Basil, Sage, and Rosemary. 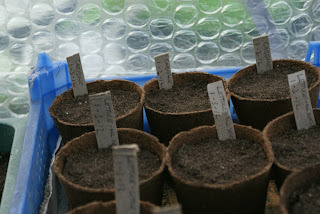 God only knows how I will get on with these though as they can be quite hard to start off from seed. 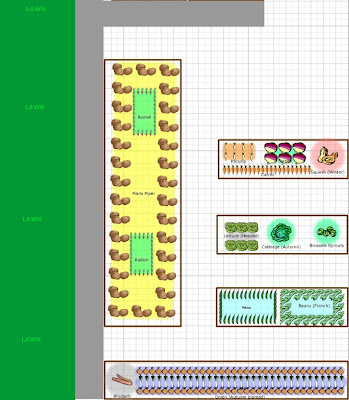 Speaking of which, the ones that I did for work’s Herb Garden are ready to be potted on. I’ll try and get some pictures of them at a later date. Sadly the Oregano didn’t survive after sprouting. Not too sure why and will see how my seeds get on here for further analysis. I also started off my Lettuce’s and Cabbages and for these I’ve used degradable pots that you sown in and then plant out the pot without disturbing the root system. 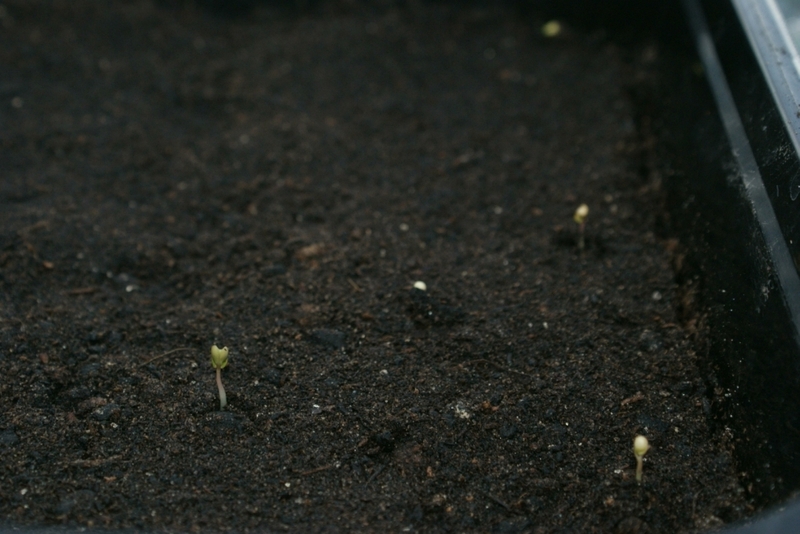 As the pot goes in to the soil outdoors, it breaks down for the roots to expand out of. I didn’t have any problems transplanting Lettuce’s or Cabbage’s last year but thought I’d still try them in these pots this year. 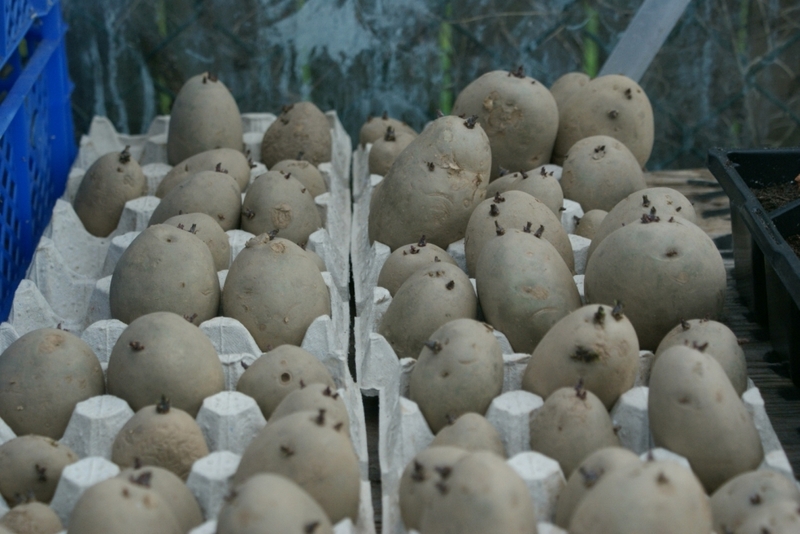 My spuds are still chitting and the onions in their modules have put on some good size growth so I’ll be getting them in the ground soon. My Brussels have started to sprout as well now so it’s all systems go. Friendly reminder. If you're reading this on Facebook or Twitter then you'll only receive the text portion of my updates. 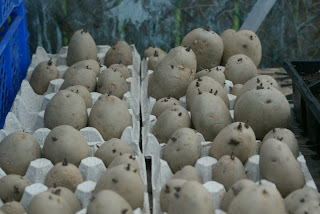 Clicking the link will take you to the full blog that includes photos amongst other things. On to the update. Judging by today’s weather would have you thinking Spring could well be on its way. Evening temps are rising nicely (or should that be falling not as sharply?) 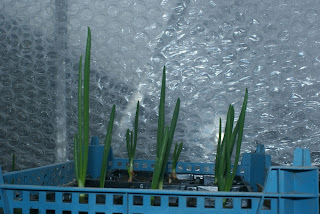 and the greenhouse is reading 18c even when the door is open but then it is March after all! 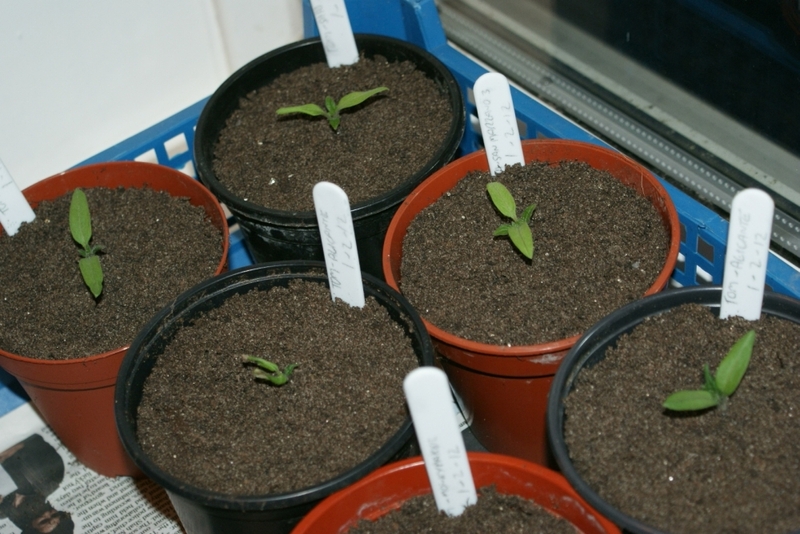 My Tomatoes were repotted 10 days ago although I’ve whittled out the weakest one of each variety. That leaves the two strongest of each and I’m happy with that. Last year saw me cling on to everything even though I knew I didn’t even need them. Mind-set’s have changed. 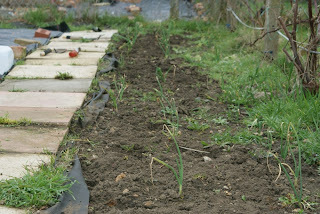 My overwintering onions took a battering over winter and so I brought a bag of backup sets after Christmas. Last weekend saw me start them off in modules. 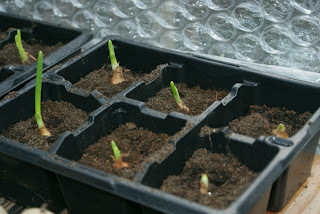 I’ll give them a couple of weeks before transplanting them. 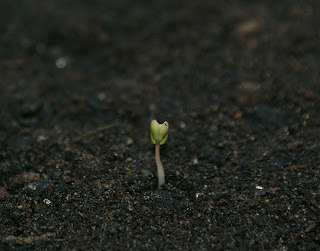 I also started two BroadBeans and three Pea seeds. 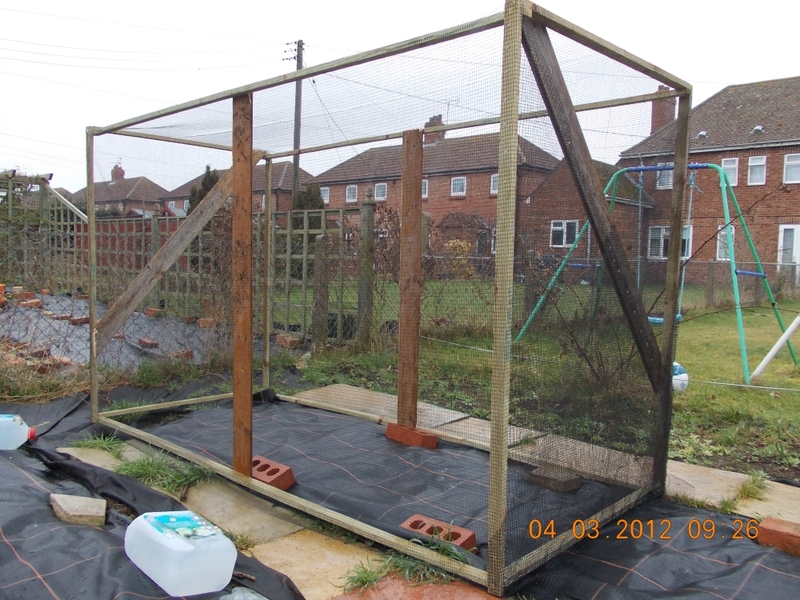 I’ve also brought a couple of cold frames from Argos. They were on offer and I had a spare voucher so they haven’t cost me anything extra. If I had paid full price for them I would have felt cheated but at £12 each I’m happy with the extra protection they will offer. I just need to look after them so they last more than 2 seasons.